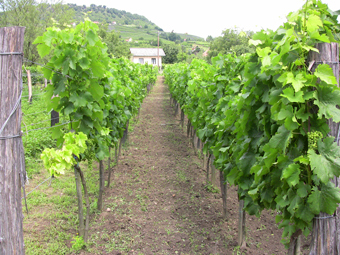 We harvest in early October by which time the grapes have achieved an optimum level of maturity. Some vintages may be exceptional and picking can start as early as the last week of September. All the grapes are hand picked and meticulously selected in the vineyard. We de-stem and crush the fruit after which the juice is kept on the skin for a period of 4 to 8 hours in order to enhance the extraction of aroma precursors. The crushed berries are then basket pressed. 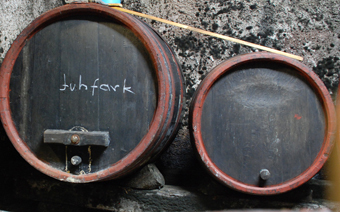 The juice is transferred into old barrels of 400 litres in size where spontaneous fermentation takes place. When the fermentation is finished, the barrels are topped up and they are not racked up until Christmas. The wine is barrel-aged for a period of 12 to 14 months, which is followed by a further 10 to 12 months in stainless steel tanks before bottling. We also like to allow the wine to mature in bottle for a quarter of a year before releasing it for consumption.